They may be prizewinners or bedraggled street survivors, but no matter—each is precious and fills our lives with joy. And our animal companions were meant to be shared; we can spend hours recounting memorable moments to fellow pet companions, sharing images on social networks, our phones overloaded with photos. Animals are fascinating and beautiful, and I enjoy the challenge of creating their likeness on paper in whatever medium suits the event best. My cats are the reason I am an artist today—they inspired me to share them with others in the best way I could, and I have spent years developing my skills and talent with their likenesses. A portrait of your animal companion is different from a photograph; I create a composite portrait from many photos and perhaps a meeting. In doing so, I can remove a background from a scene and add another, include toys or even group animals together in a way they’d never pose. 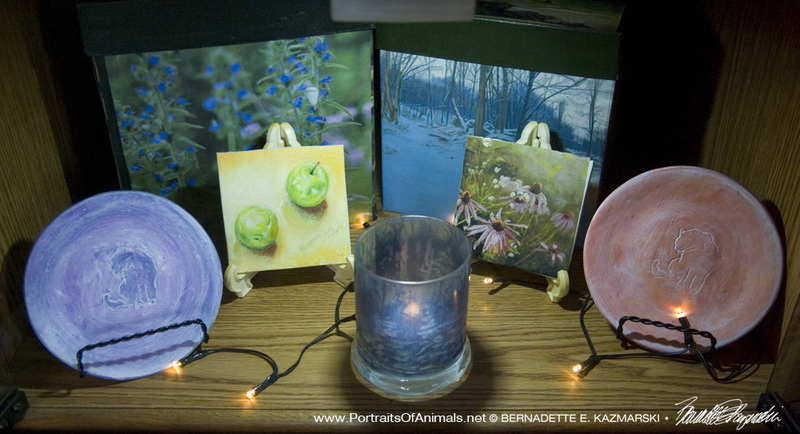 More than a few of the portraits I have created have been memorials to pets who are gone but will never be forgotten. 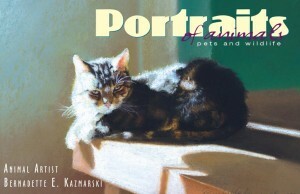 Many have also been portraits of a friend’s or family member’s pet given as a special personalized gift. And in the end, you have a piece of original artwork. See a demonstration of how I put a portrait together or view my portfolio. Or scroll down and read about how to design your own portrait, what media I use and how much a portrait may cost. “The Washburn Trio”, 14″ x 11″, watercolor, a Mothers’ Day gift, 2006. Your pet’s portrait need not be a face forward shot of a classic pose—a good portrait captures the attitude of its subject. It can be a picture of a typical event in your pet’s daily routine, or one of those singular moments you love to tell everyone about. The more interesting, the better it describes your best friend, and the more I enjoy creating it. Working from your photographs, your custom portrait can include one or more pets and even family members (I do people, too), in pastel, pencil, pen and ink, watercolor or colored pencil. Portraits can be any size or shape (within limitations, of course), and you don’t need to have the perfect picture to get the pose you really want; I usually work from several photographs to create one portrait. And even with a good picture, I usually request a few extra pictures to make sure I can clearly see markings and coloring, and if possible, I like to meet my subjects so that I can get to know their personalities and snap a few more pictures. 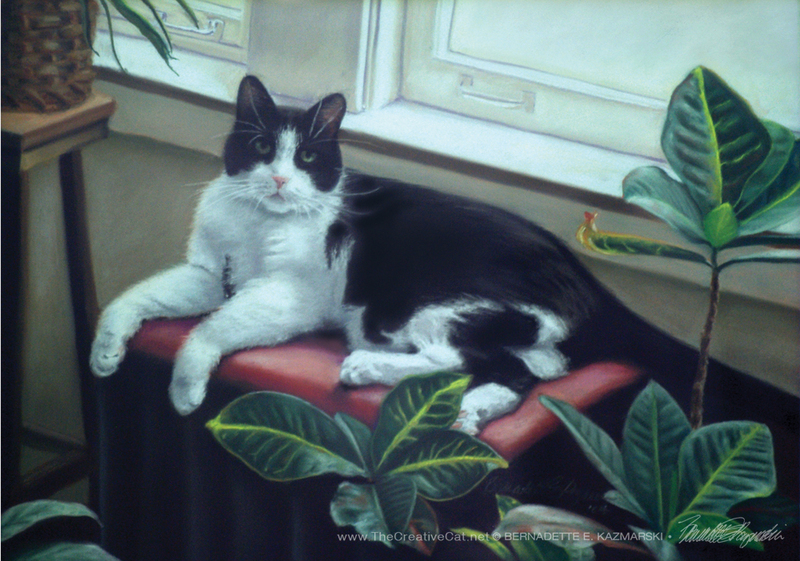 “Bandit”, 16″ x 23″, pastel, 2004, one very special cat. Pictured here are but a few of the portraits I’ve created, and I’ll be glad to tell you their stories and many more. I will always give an estimated charge before starting a portrait based on size and complexity. Below are a few guidelines to determine how much your portrait might cost. Portraits start at $50.00 for a black and white 8” x 10”, and $100.00 for a color 8” x 10”, one subject only with no background scenery or objects. I reserve the right to limit the content according to the finished size. Prices are quoted per job, and include only the drawing (no mat or framing). More than one subject is extra, as is combining two pictures and other customizations, usually added on in $25.00 increments for increasing size, or $50.00 or $100.00 for extra subjects and backgrounds. I’ve included three fairly typical portraits here and I’ll use them as samples for how I determine pricing. 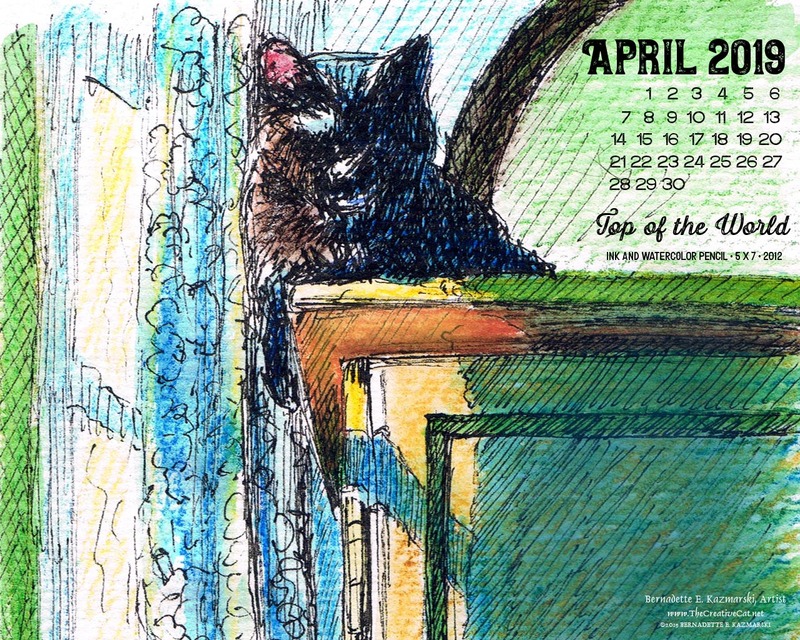 “The Johnson Family” at the top includes eight animals, all from different years in one couple’s life together. I had stacks of photos for each one, though the oldest ones did not have good photos so I had to use other cats’ photos from my photo collections as examples for their size and coat patterns. The portrait image area is 15″H x 33″W. Because of the size of each subject and the spent on each to put together the photos to paint each one, the subjects cost $100 each, so the basic portrait cost $800. They gave me photos from nearly three decades, all of which I pieced together for nearly ever subject, and this was an extra $200 so the portrait itself cost $1,000 total. I also framed it for them; that was extra, but it cost much less than it otherwise would have. 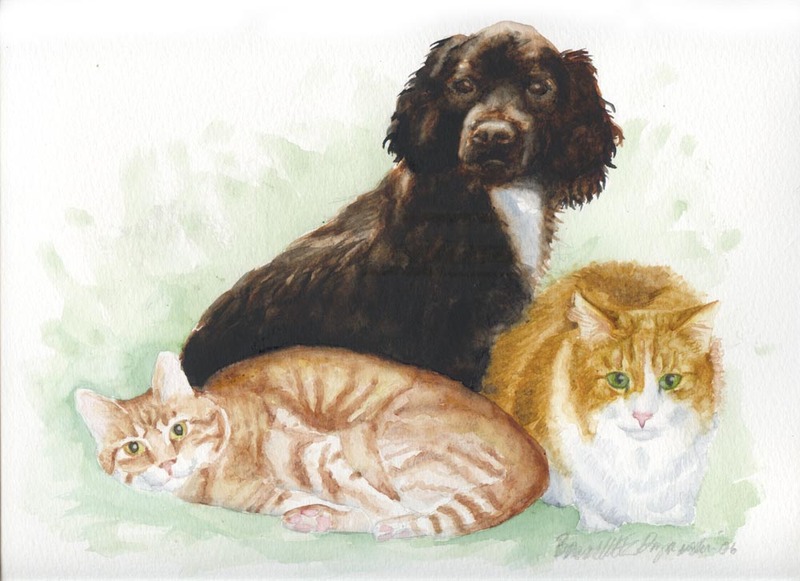 “The Washburn Trio”, above, was fairly simple because it was a surprise gift for Mothers’ Day and the daughter could only get one photo of each pet and it worked out that I could them together as they appeared in their photos. This was a savings because I didn’t have to sketch out a composite of the pets by pulling details from multiple photos which is well worth the effort but time-consuming. The portrait is 11″ x 14″, and for this I charged the basic cost of $100 which covered the cost of one subject, then $100 each for the other two subjects for a total of $300. You can read more about this portrait in “A Very Special Mothers’ Day Gift” on The Creative Cat. “Bandit”, above, has one subject but a very detailed background, and it’s fairly large, 16″ x 23″. I loved the photo as soon as I saw it, and even though it would cost extra with all that detail it meant so much to them. 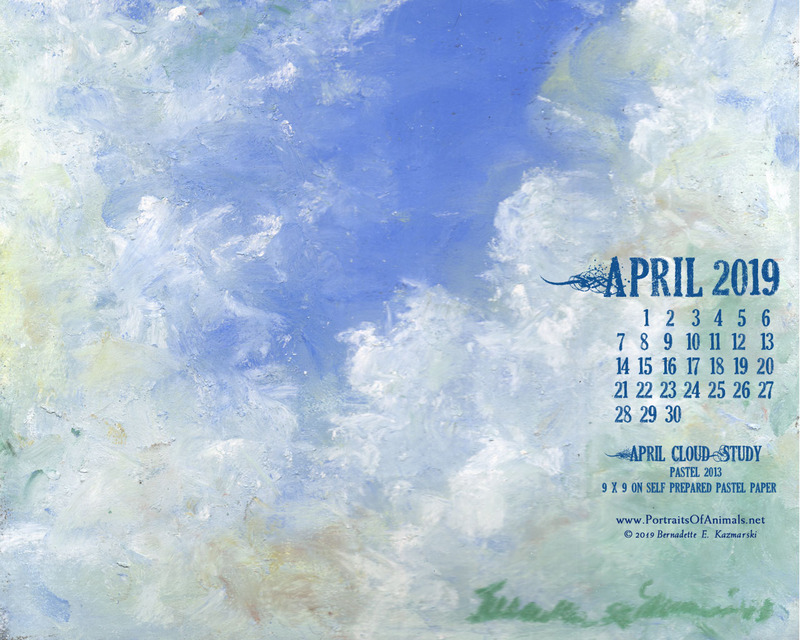 The basic cost of this one was $300 because of the size, which covered the subject, with another $200 to paint the detailed background, for a total of $500. You can read more about this portrait in “Bandit Stole His Daddy’s Heart” on The Creative Cat. 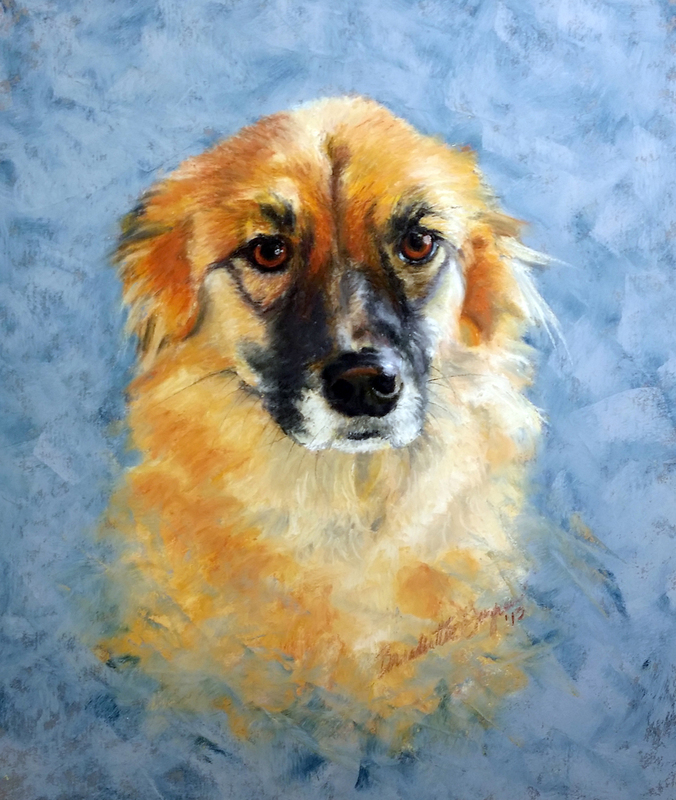 “Paige”, below, is fairly typical for a larger dog because a full-body portrait often makes the portrait too big, or it makes the subject’s face too small to see the expression in the eyes, so a “bust” portrait often works to accommodate the portrait. This portrait was one step up from the basic size at 16″ x 20″ so the price increased by $25 to $150, and the background is a complimentary color but without detail so there was no extra charge for that, the portrait cost remained at $150. “Paige”, 11″ x 14″, pastel, 2014. We will discuss your portrait and agree on what you will supply and what I will do with it, and sign a contract before I start your portrait. I request half of the full price of your portrait as a down payment. When your portrait feels just about done to me, I will show it to you (if possible), and we can discuss any possible changes or additions or agree that it is done. I request the balance before I frame your portrait and hand it over to you. Framing is charged as a separate item, and we can discuss the framing when you contract for your portrait, whether I frame your portrait or not. All photographs and other materials which you give me to produce the portrait are returned in their original condition when the portrait is finished. Animal artwork is not limited to pictures of your own pets, but may include pictures of any sort—wildlife pictures taken from a book or magazine, for instance. In addition to portraits of your pets, I also offer portraits of your people, your house, or any other item of which you may want a portrait. I can always hold on to a portrait until a holiday, birthday or other event arrives, and I can keep a secret if the portrait is a gift. And below are two portraits that are a little different, so consider other possibilities when considering a commissioned portrait. First is “Veronica’s Tulips”. Veronica had lived with and loved many schnauzers and wanted a portrait, but not of just one of them. 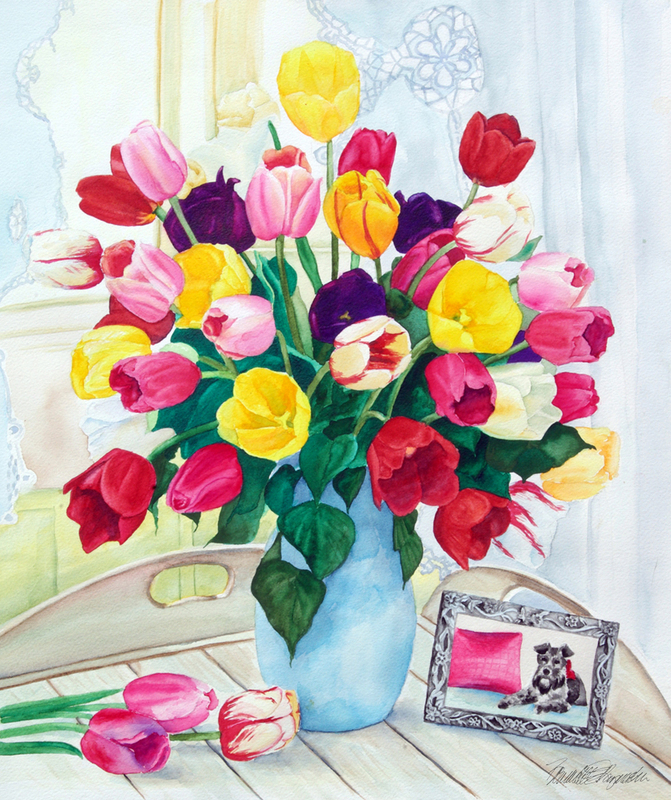 She also admired a painting of tulips I’d done and so combined the ideas into a still life with a schnauzer in a picture frame much like a room she’d love to have. A painting for the grandparents, “The Grandchildren”, all of them, human and feline. 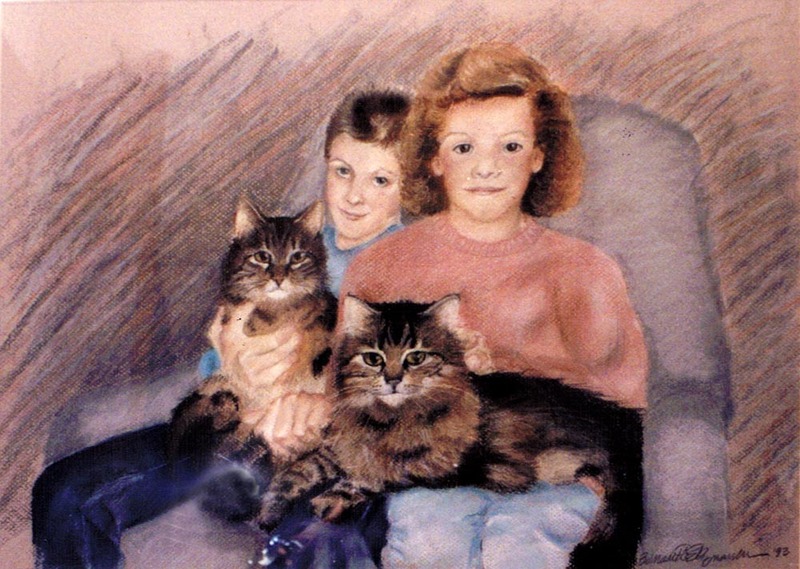 I’ve done a number of portraits of people with their pets, but many years ago I painted a very special portrait for grandparents who lived in Germany and never had the chance to see their grandchildren and grandcats. A photo was impossible to manage for the parents, so, with photos from the parents, I put together a portrait of them all together in a style they requested, more sketchy than finished. I thought I’d taken a better photo of it at the time, but this sample is all I have; it was shipped off to the grandparents that year. And that photo of yourself with your precious animal companions that you never managed to get. Anne loved animals but lived with none while she studied to become a doctor, then Same showed up to be rescued on her parents’ rural land. He was diabetic but her medical skills kept him healthy as long as possible, but never long enough, and she had no photo of one of her most precious memories of holding him. We put it together with her photos, and had a custom oval frame made for the portrait. Read more about my commissioned portraits on my website at Portrait Demonstration, and view my portfolio to see some finished portraits. My brochure is an 8.5″ x 11″ two-page full-color PDF that half-folds when it’s all printed out. The text is basically the same as what’s above with a few updates and additions for it appearing on this site. 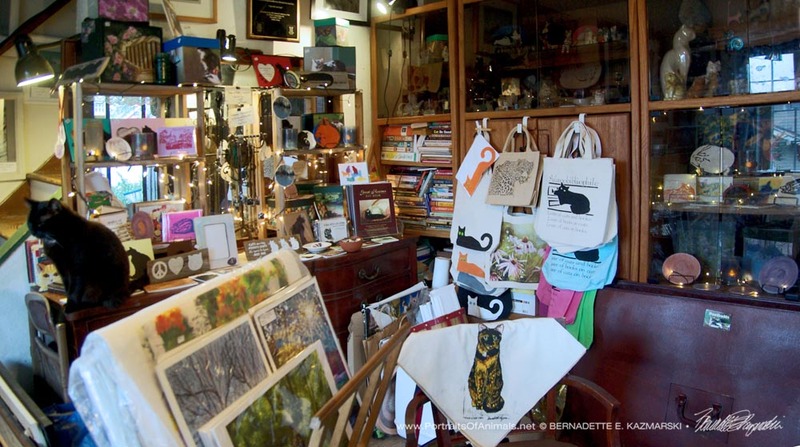 Is there an animal lover on your list who has every cat or dog-themed t-shirt and handbag, and even their pets have every toy they can use for the rest of their natural lives? Consider a gift certificate for a commissioned portrait. Whether it’s for someone else or yourself, a custom portrait is different from a professional photograph because we can create the scene that you remember even if you never had the chance to photograph it. Your household of animal companions can be grouped in a natural setting even if their lives didn’t overlap. I offer gift certificates for portraits in any denomination beginning at $50.00, which is the basic cost of an 8″ x 10″ black and white portrait; the recipient is responsible for any amount the portrait costs over the amount you’ve paid. The certificate itself is 8.5″ x 11″ and features a collage of portrait images with the recipient’s and giver’s names, printed on parchment cover stock. The whole thing is packaged in a pocket folder and includes a brochure, a letter from me to the recipient and several business cards. The certificate package can be easily mailed or wrapped as a gift and shipped directly to your recipient. Certificates are good for up to one year after issue, but I’ll usually honor them whenever they come along. It just makes my accounting easier if it’s within the same year. I prefer to look over the work and price the portrait according to how much work will go into it, as described above, but you can either set a budget or get started by purchasing a certificate for yourself or as a gift. “Certificate A” is for a minimum-size 8 x 10 black and white or monochromatic portrait with one subject. “Certificate B” is for a minimum-size 8 x 10 color portrait with one subject. Choose “A” or “B” depending on whether your portrait is black and white or color. If your portrait will be larger or have more subjects, add $50 or $100 or more to your certificate value with the drop-down below. Color: black and white media such as charcoal, pencil, ink, or monochromatic media such as one color of pastel, watercolor, colored pencil, etc. Color: full color media such as pastel, watercolor, colored pencil, etc. You can use the second drop down to add $50.00 or $100.00. For amounts over this I’m working out the easiest way to give options so it’s not too confusing. As my way of giving to shelters, I donate a limited number of commissioned portrait certificates to shelters and rescue groups every year to sell or auction in their fundraisers. I usually donate a certificate worth $100.00, the minimum cost of a color portrait, and they typically auction for well more than that. The winner receives a presentation folder with the signed certificate, a thank you letter from me for supporting the organization, one of my brochures and the invitation to begin the process of a portrait of their design. 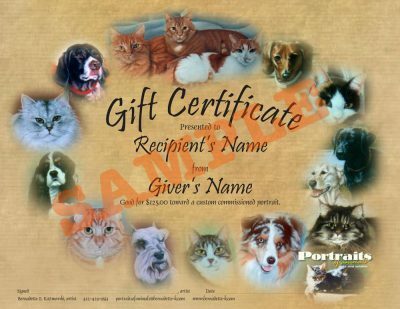 I have to limit the number of certificates I donate because of the amount of time I put into each portrait, but I also offer commissioned portrait certificates at a reduced cost to other shelters and rescues when my yearly quota is reached. I like to help as many organizations as I can, but the kitties need to eat too! Please contact me if you are interested.